GNI is excited to announce that Lady Bunny will be headlining for the men of GNI during the 2017 GNI Annual Gathering in August! Earlier this year on the GNI Facebook page, a suggestion came from an attendee that we should consider inviting Lady Bunny to perform or DJ for us. GNI takes suggestions seriously so we reached out to Lady Bunny's agent to see if she was available to perform. It didn't take long before we had a solid yes from Lady Bunny; we worked out the details, got a contract signed, and here we are ... now letting you know that Lady Bunny will be joining us. We know this will be a fantastic show! There is still time to register - August 18 - 27, 2017! "There have been recent brushes with the art world as well. Most recently, Bunny DJ'ed for a three-day exhibit at Faena Gallery in Buenos Aires for a disco-themed art installation by assume vivid astro focus. And Bunny performed original music and conducted a heart-felt interview with pioneer video artist Charles Atlas called The Waning Of Justice at the Luhring Augustine Gallery. (Charlie’s other documentary subjects include Leigh Bowery, Antony and Merce Cunningham.) And Bunny was delighted to be picked as one of home decor guru Jonathan Adler’s muses for his original Inspiration Points series after Jonathan designed a pitcher modeled after Bunny. In the last three years, Bunny has created two one-'woman' shows at La Escuelita. Both That Ain’t No Lady! and Clown’s Syndrome were extended for months after sell-out crowds and a rave review from the NY Times’ Charles Rooney which stated: “Most of Lady Bunny’s best lines are unprintable here, but more than any performer I saw this year 'the old pig in a wig,' as she calls herself, made me weep with laughter, often while groaning with disgust. And isn’t that what the best low comedy is all about?” Clowns Syndrome earned this glowing review from Irish Central: “A downtown drag fixture for over two and a half decades, in her new show Clowns Syndrome the self-professed 'pig in a wig' has crafted the funniest, most engagingly thoughtful and by far the most entertaining drag show I have ever seen.” Michael Musto called it “the funniest show in town.” Both shows toured the globe from LA to Palm Springs to San Francisco to Fort Lauderdale to Provincetown to London to Puerta Vallarta and four cities in Australia. Her current touring show, entitled Trans-Jester just had a successful run at London's Soho Theater and has received rave reviews in the New York Times, OUT and Huffington Post." 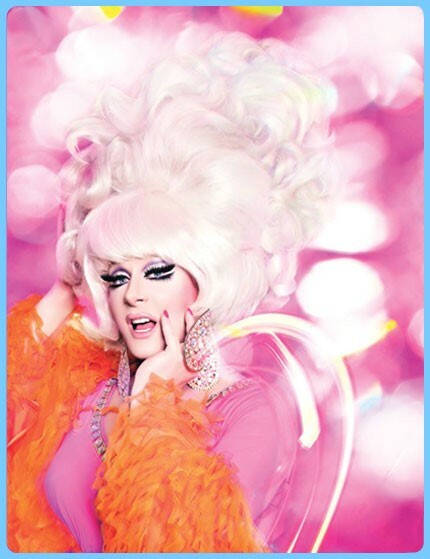 "Talented, glamorous and funny as hell, Lady Bunny is a glittering comet hurtling toward Planet Show Biz. Brace yourself for impact!"